Thom Hogan's Complete Guide to the Nikon D600 and D610 helps you understand and master the use of the Nikon D600 or D610 DSLRs. The Second Edition now has 823 pages of detailed, complete, cross-referenced, indexed, and useful information about both generations of the camera: you'll find all your questions about the D600 and D600 and how to use them are answered. This book (supplied as a printable eBook PDF file) contains everything you'd want to know about the D600 or D610 camera and how to use it. You'll find deep explanations with more examples and suggestions than in previous and other guides, all in the no-nonsense and understandable writing style for which Thom Hogan has become famous. No matter how well you think you know the D600 or D610, you'll find things in this book that you didn't know about it. That's why it's called a "complete guide." What's covered? Autofocus, metering, video, card selection and use, lenses, image quality, and yes, even the D600 dust problem...basically everything there is to know about the D600 and D610. The Complete Guide to the Nikon D600 and D610 Second Edition is a must-own for any D600 or D610 user. There simply isn't any other work out there that comes close to touching the detail, usefulness, or completeness of this work. The work can only be purchased from this site. A complete instruction manual and an introduction to relevant digital issues in one book. 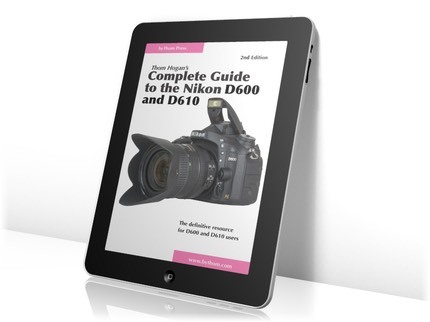 Thom Hogan's Complete Guide to the Nikon D600 and D610 manages to not only fully describe every feature of the D600 and D610 in clear, easy-to-understand language, but gives you rich, technical background for many of the critical issues that confront digital camera users. Nikon flash and autofocus modes explained in plain English! Wonder how i-TTL flash works? Can't figure out Dynamic autofocus, Release Priority, Focus Priority, 3D autofocus mode, and a host of other terms used to describe features of the focusing system? Thom Hogan's Complete Guide to the Nikon D600 and D610 explains these terms and accompanying techniques in the same simple, no-nonsense language that made his Nikon Field Guide a best seller. Includes instructions for the SB-400, SB-700, and SB-900/SB-910, including for wireless use. Note: The eBook does not cover the WU-1b wireless transmitter. Current version: 2.02 (owners of earlier versions will receive an email with an update offer to the Second Edition) Compatible with Adobe Acrobat Reader for Macintosh, Linux, and Windows. eReader and iPad users: the PDF files have been tested on the Kindle and Kindle Fire, as well as various iPads using the latest versions of their software. Other devices are not supported (though they may be able to use the files). Kindle users should read my PDF FAQ pages, as Amazon's direct PDF support is limited mostly to reading (there are other options for Kindle Fire users). See this page for more information about what you can read my books on. Copyright page identifies the work as 2.00; should be 2.02. Header pages are correct.